Sathya Sai Baba, the guru who died on April 24 at the age of 84, had a simple eight-word slogan to summarize his teachings: "Love all, serve all; help ever, hurt never." He encouraged his followers to meditate and sing devotional songs, and to take his darshan  that is, to see him in person, the better to experience his divine presence. He was also accused of faking miracles and of being a sexual predator. Nevertheless, at his death, he counted among his devotees industrialists, Cabinet ministers, a former Indian Supreme Court justice and the founder of Hard Rock Cafe. Perhaps 500,000 people may attend his funeral on Wednesday. His most famous follower, cricket champion Sachin Tendulkar, had reportedly been holed up in mourning in a hotel room over the weekend. P.K. Khandelwal, one of his devotees in New Delhi, told TIME, "I feel like I have lost everything." Sathya Sai Baba will be buried with full state honors in the true tradition of Hindu spiritual leaders, his body wrapped in orange clothes, the funeral attended by high-ranking officials and celebrities. Believing in the Baba was easy. Devotees were not required to adhere to any particular set of beliefs or renounce worldly pleasures; non-Hindus did not need to change their religion. "I am God," he would say. "You too are God. The only difference between you and me is that while I am aware of it, you are completely unaware." With that approach, he attracted a following of some 6 million people and amassed a fortune in the form of a charitable trust valued at an estimated $8.9 billion. According to its most recent filings with India's Home Ministry, the Sathya Sai Trust received $19.5 million in foreign donations in 2009 alone. His influence afforded him a large measure of impunity. When a 2004 BBC documentary aired accusations that he had sexually abused boys and young men, the claims caused alarm among his followers outside India but were never investigated or prosecuted by Indian authorities. Sathya Sai Baba dismissed the accusations as the mere "cawing of crows." Born in the village of Puttaparthi in rural south India as Sathyanarayan Raju, he was 14 years old when he announced to his stunned family that he was the reincarnation of a 19th century holy man called Sai Baba from the town of Shirdi, who combined elements of Hindu and Muslim practice. He won many followers by way of alleged miracles. But in the mid-1970s, the Indian magician P.C. Sorcar duplicated one of Sathya Sai Baba's signature miracles  conjuring things out of thin air, from sacred ash to trinkets to Swiss watches. "His magical tricks never impressed me. They were not of high quality," Sorcar told TIME. "As a performer, if your tricks get caught out, what remains of you?" Soon after Sorcar's duplication of his magic, Sathya Sai Baba began to take on the role of philanthropist, transforming the small temple and ashram in his hometown of Puttaparthi into a multimillion-dollar complex of good works. His charitable trusts run schools, hospitals, colleges, stadia and a planetarium, as well as a piped-drinking-water project serving more than 750 villages in the surrounding areas. The projects attracted donations from around the world, most notably a $108 million gift from Isaac Tigrett, the founder of Hard Rock Cafe. Tigrett gave his proceeds from the sale of the rock-music-themed restaurant chain to fund the Sri Sathya Sai Institute of Higher Medicine, a free 500-bed hospital, in 1991. 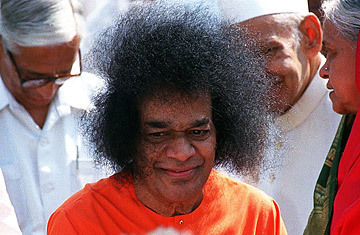 December 1997 may have seen Sathya Sai Baba at his height. He played host to an all-star international cricket match, inviting an Indian team captained by Tendulkar to play a team of top players from the rest of the world. He had a new, state-of-the-art cricket stadium built in Puttuparthi just for the event, which was inaugurated by then Prime Minister I.K. Gujral and broadcast on state-owned television. Thousands of people went to watch their cricket heroes compete for what was said to be a 20-kg solid gold trophy  and to take advantage of the free breakfast and lunch. While the next leader of the Sathya Sai Trust has yet to be named, board members promised that Sathya Sai Baba's charitable work would continue uninterrupted. "There is or will be no vacuum and we firmly believe that Baba will continue to guide the trustees," the board said in a statement. In the meantime, Sathya Sai Baba's body will lie in state at his ashram till his funeral. Raj Verma, whose son and daughter-in-law are ardent devotees of the Baba, flew on Monday to have a last glimpse of him. "They were so distraught that they even left their children behind," he told TIME. "They believe that he will come back to life again. You cannot question such strong belief." See the top 10 earth goddesses. See pictures of India's health care crisis.